The owner of Sopharma Pharmaceuticals Ognian Donev and the owner of Darik Radio (revealed to have been a collaborator of the Communist regime secret services with the alias “Karak”) Radosvet Radev are on their way to become top bankers in the Republic of Moldova. Their joint venture DOVERIE UNITED-HOLDING PLC is purchasing a 63.9% stake in Moldavian “bad apple” – Moldindconbank S.A. (MICB). In 2010-2014, this bank, the second largest bank in Moldova, was involved in large-scale international scandals about which Bivol also wrote. The scandal, known as the “Laundromat”, involves the laundering of USD 22 billion from Russia – as well as the syphoning of over USD 1 billion from the Republic of Moldova’s banking system – an affair called by the local media “the theft of the century”. The deal was made clear by the official press release of the National Bank of Moldova (NBM), the country’s central bank, announcing the acquisition agreement on its site on Tuesday, January 22. “The Executive Board of the National Bank of Moldova (NBM) decided on Tuesday, 22 January 2019, to give the prior permission to “DOVERIE UNITED-HOLDING AD” for the acquisition of the share package in the amount of 63,89 percent of BC „Moldindconbank” S.A.,” the press release said. The Moldovan banking regulator’s announcement also states that the “investor expresses his interest in an appropriate period for BC “Moldindconbank” S.A., after the NBM decided by law, on 18 January 2019, to extend for the last three-month period the sale deadline of the newly issued shares of this bank”. Thus, according to NBM, “the takeover of the single share package by the investor will create conditions for an orderly leaving from the NBM early intervention regime, so that the BC „Moldindconbank” S.A. not to be affected. This will continue to operate in normal regime and provide the full range of services, including those related to deposits, lending and settlement operations”. “DOVERIE UNITED-HOLDING AD” intends to come up to BC „Moldindconbank” S.A. with a team of managers with a broad international experience in the banking sector. In this regard, the NBM assesses the intention of the potential investor as a notable opportunity to develop „Moldindconbank” on long-term and to increase the competitiveness and quality of services provided to its customers… DOVERIE UNITED-HOLDING AD” aims to enter into the banking market of the Republic of Moldova after an ample assessment of the market evolution and the economic context of the country… DOVERIE UNITED-HOLDING AD” is presented to be one of the most important companies in Bulgaria, which was founded in 1996 as a privatization fund with a participation portfolio in more than 20 economic enterprises that operate in more countries of the region,” the press release of the NBM further says. According to the online edition Newsmaker.md, on January 23, the authorities in Chisinau had to meet in the National Committee for Financial Stability to decide on only one issue – whether to negotiate the way the deal takes place – whether the State would buy the MICB shares and then sell it to the investor, as was the case with Moldova Agroindbank (the largest bank that was under special supervision). The newly appointed Governor of the NBM (until recently Minister of Finance) Octavian Armasu personally boasted the deal with the Bulgarians before Moldovan journalists. He assured the media that “the investor had passed all the checks” and it was a “reliable company”. According to the Governor, DOVERIE could afford such a deal as it has enough money to buy the bank’s shares and maintain its operations. He was also firm that DOVERIE does not have even a potential conflict of interest as a foreign company. “The prospective buyer is not linked to Moldova, and there are no Moldovan citizens in the company’s leadership,” he said. Octavian Armasu forgot to mention that in April 2017, Sopharma, in which Ognian Donev is the majority shareholder, managed to buy in Moldova the controlling stake of 51% of a chain of ten pharmacies from the local RAP Pharma International. The deal was approved by the local watchdog – the Competition Council of the Republic of Moldova. The chain of pharmacies at that time held about 3% of the market share in the phramaceutical retail in Moldova. As the Moldovan edition Mold Street wrote, the established in 2004 company RAP Pharma International has also had shareholders from Bulgaria, precisely the company “Molfarm” Ltd, which had been controlled by the Bulgarian citizen Plamen Milanov. 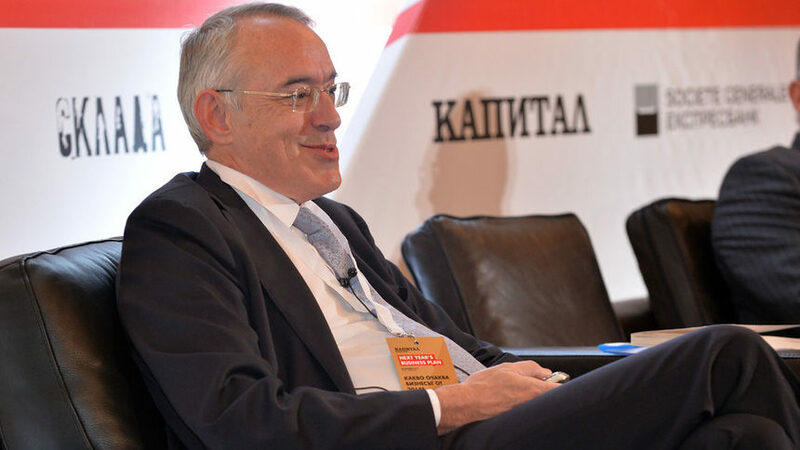 Milanov’s firm held 80% in RAP Pharma International, and the other 20% belonged to Moldovan Victor Alergus. In 2014, RAP Pharma International built a chain of ten pharmacies and after that it received a retail license. In 2017, the controlling stake of 51% was bought by Bulgarian Sopharma Pharmaceuticals. A check by Bivol in the Trade Register showed that “Molfarm” Ltd has been indeed registered in the Bulgarian capital in 2014 by Plamen Stefanov Milanov at the following address – 5 “Vazkresenie” Blvd, “Krasna Polyana” district, 1330 Sofia. The registered funding capital was BGN 20,000. The scope of activity includes “wholesale in the country and abroad of medicinal products, pharmaceuticals, medical devices, consumables, cosmetics and others, commercial intermediation and representation, consultancy, as well as any other commercial activity which is not forbidden by law”. Two other companies owned by Milanov are registered at the same address – “Hospice Faith and Hope” Ltd (2013) and “First Company” Ltd (2008). “First Company” Ltd also has a connection with Moldova as it has been registered in partnership with Moldovan national Ruslan Pavlovic Rotar. The registered founding capital was BGN 5,000. The main business activity is “wholesale and retail of pharmaceutical, medical and an orthopedic products”. Since June 2015, Moldindconbank is under the special supervision of the NBM, together with two other banks – Moldova-Agroindbank (MAIB) and Victoriabank. The special supervision is introduced in cases when it is established that the bank or its shareholder or management have violated the Credit Institutions Act of the Republic of Moldova or other normative acts of the NBM, including the licensing terms. Then, NBM blocked these 63.89% of MICB shares and another 43% of the shares of Moldovan Agroindbank (MAIB) – Moldova’s largest bank. The owners of the two leading banks in Moldova were exposed in being in a cartel agreement. Shareholders with blocked shares were ordered to sell their shares within three months in 2015, but they did not. Therefore, MICB and MAIB canceled these shares and held a new issue of shares. They issued new shares in the same volume as the canceled ones, after which they were put up for sale, but buyers had not been found immediately. As early as 2015, the Moldovan government announced it would act as an “intermediary” between banks and potential strategic investors. The aim was to assuage buyers’ fears that bank assets in Moldova could be a dubious investment. In its press release, the NBM acknowledges that “in September 2017, the company has also received the NBM prior permission to acquire the share package of another licensed bank of the Republic of Moldova. For objective reasons that transaction was not carried out”. The “objective” stumbling block is the acquisition of the fourth-largest Moldovan bank Victoriabank by one of the leading financial groups in Romania – Banca Transilvania (BT). In the beginning of 2018 Victoriabank was sold to the Romanians for about RON 766 million (about EUR 40 million). According to information provided by business journalist Ion Preasca of Bivol’s partner – the center for investigative journalism RISE Moldova, the Bulgarians have indeed negotiated not only for Victoribank but also for the largest bank in Moldova, MAIB, with a loan portfolio of about RON 20 billion (EUR 1, 2 billion). Representatives of the Bulgarian buyer had met with the NBM for this reason, but a deal was reached only in early 2019, when the MICB acquisition was agreed. The Organized Crime and Corruption Reporting Project (OCCRP) broke the story of the Laundromat in 2014, but in 2015, the reporters from OCCRP and Novaya Gazeta in Moscow obtained a wealth of bank records which they then opened to investigative reporters in 32 countries. According to RISE, it was “the largest money laundering scheme in the history of Eastern Europe”. Of the entire USD 40 billion in the Laundromat scandal, a little over half of the money (USD 22 billion) had passed through the Moldovan MICB. The scheme had been implemented between 2010 and 2014, when various criminal groups and corrupt politicians had managed to transfer billions from the Russian Federation through the “laundering mechanism” consisting of straw legal entities – business owners, financial institutions and fake credits. The proverbially corrupt Moldovan politicians and government clerks had provided the cover-up for the scam. At its last stage, appearances of compliance with the law had been created, such as court rules, allowing funds to flow to Western Europe and offshores. At the same time, according to Moldovan prosecutors, more than 90 different Russian companies have participated in the Laundromat and have made thousands of cash transactions to bank accounts in Moldova, from where MICB has redirected them to various offshore jurisdictions. Former shareholders, and some of those remaining in the Bank, are associated with Russian-Ukrainian businessman Veaceslav Platon, who was arrested in Kiev in 2017 under a mutual agreement between the President of Ukraine Petro Poroshenko and Moldavian oligarch and politician Vladimir Plahotniuc, chairman of the Democratic Party of Moldova. After that Veaceslav Platon was extradited to Moldova, where there is an ongoing court trial against him while he remains in detention in Chisinau. He is charged with money laundering and unsecured lending. “Ukrainian and Moldovan citizens, some of his friends, representatives of various Ukrainian and Russian companies, all of them, as proxy-type shareholders, have been part of Platon’s organized crime group,” Ion Preasca told Bivol. Preasca says that MICB is currently in a very decent condition for a bank that is under special supervision. It has reported a profit of RON 500 million (about EUR 25 million) in 2018, which is more than a third of the profits of the entire banking sector of Moldova in the past year, he explains. According to him, the price of the MICB share package had been established by the NBM on the stock exchange at RON 760 million (about EUR 39 million), and it is a very good price for such a bank with surprisingly good loan portfolio indicators, even better than the one bought by the Romanians – Victoriabank. That is precisely why, according to Preasca’s sources, the Romanian Banca Transilvania had wanted the most to acquire MICB as the second largest by assets in Moldova and not Victoriabank, which currently ranks fourth (the third is Mobiasbanca of the French Societe Generale Group). Nevertheless, despite the perfect condition for a bank under special supervision, the acquisition of MICB can lead to serious reputation problems for DOVERIE. “The risks of political and legal nature are related to the potential claims of the former shareholders in the Bank, who could eventually pursue new actions to recover their rights or to be compensated for their shares,” Ion Preasca explained. The reason is the scandal with the Laundromat, which has tarnished the international image of the Bank. The Moldovan journalist commented that one of the decisions would be to rebrand the Bank by changing its name, something that can have a positive effect, but can also inflict damages to the Bank, as he stressed. On January 23, Bivol attempted to reach the management of DOVERIE for comment, but no one answered the phones listed for contact. That is why we sent emails to the Chairman of the Board of Directors of Sopharma Ognian Donev with nine questions on the necessity of the deal in Moldova by DOVERIE Holding, in which Radosvet Radev and Donev’s son Ivan Donev are members of the Supervisory Board. We received the following replies from DOVERIE’s e-mail address. What is DOVERIE planning to achieve with the acquisition of MICB? As you know, in the last year, the Republic of Moldova has made some decisive steps to improve its banking sector. As part of these efforts, the largest Moldovan bank, Moldova Agroindbank, was sold to a non-strategic investor – Latvian and US non-financial institutions, with a minority stake acquired by the European Bank for Reconstruction and Development (EBRD). The third largest bank, Victoriabank, was also sold to an investor – a financial institution from Romania. We believe that the participation in this process is a good opportunity for Holding DOVERIE, which has strong positions in the Bulgarian financial sector. Is it true that the package price is RON 760 million? For now, we cannot talk at all about a price. The shares are not the subject of a sale and the Republic of Moldova is yet to determine the basic parameters of a possible transaction – a tender procedure and a buyer. In any event, as far as we know, if there is a sale, it will be organized by the Moldovan State through a public auction in which all interested parties may participate. Only the Moldovan State may be the seller, through the Moldovan State Property Agency. Aren’t you worried that the Bank will have to be rebranded for having the reputation of the most scandalous Moldovan financial institution that has laundered USD 22 billion from Russia in the Laundromat Affair? Is DOVERIE’s management aware of the role of the Bank in the so-called “theft of the century” with the syphoning of more than USD 1 billion from the Moldovan banking system? Regarding the reputation of the asset that may be the subject of a sale, we believe that after two years of direct management by the National Bank of Moldova, the necessary measures have been taken to align the organization of banking activities in Moldova with European standards. Of course, we are aware of the scandals described in detail on the Internet, but we think that they concern specific officials who are not currently employees of the Bank. Moreover, the two banks that were the subject of a deal had the same or similar problems, but this did not prevent EU and US investors from buying shares in them. Last but not least, the EBRD is a co-owner in both deals. The National Bank of Moldova has required that the investor does not have any business in Moldova? However, the parent company, Sopharma, controls a chain of pharmacies in Moldova, isn’t this a violation and would that make it non-eligible? We are not aware of the requirement of the National Bank of Moldova that you quote that the potential investor in the banking sector must not have a business in Moldova. We believe that you have not been properly informed but, nevertheless, we would like to point out that Sopharma is not a parent company of Holding DOVERIE and, as far as we know, does not control a chain of pharmacies in Moldova. Does DOVERIE have the reputation of a “strategic investor” in the banking sector, a necessary condition for acquiring the supervised MICB? We believe that the answer to this question is given by a previous decision of the National Bank of Moldova, which in 2018 issued a license to DOVERIE to be a potential buyer of the Victoriabank share package that was subsequently purchased by a consortium with the participation of the EBRD and the Romanian Banka Transilvania. Was there any cooperation from the Bulgarian authorities for the deal in Chisinau? The Bulgarian authorities are fully irrelevant to our business activities in the Republic of Moldova. On what grounds has DOVERIE been denied the acquisition of Moldova Agroindbank and Victoriabank in the Republic of Moldova? It is not true that DOVERIE was denied the acquisition of Moldova Agroindbank or Victoriabank. On the contrary, DOVERIE was granted an official authorization by the National Bank of Moldova to buy a package of shares from Victoriabank, which is verifiable in the register of the National Bank of Moldova, and regarding Moldova Agroindbank – we have never applied for a license to buy the latter. What are Doverie’s plans to stabilize the Bank – long-term development or resale? DOVERIE’s plans are for the long-term development of the Holding in the Republic of Moldova in the event that we are selected as a buyer. Although in its responses to Bivol, DOVERIE denies having a direct relationship with Sopharma, the shares’ ownership and presence in Ivan Donev’s in the Supervisory Board reveals the potential conflict of interest under Moldovan law. However, it is no coincidence that the IMF required in the Memorandum with the Republic of Moldova that the NBM should not allow companies that are already operating in Chisinau. This was confirmed by the cited by Bivol Governor of the NBM, Octavian Armasu, according to whom the “lack of investor’s business” in the country had been decisive. But then again, the facts speak for themselves – Sopharma Pharmaceuticals, of which one of DOVERIE’s owners, Ognian Donev, is Chairman, Managing Director and a majority shareholder, is already operating in Moldova since 2017 when it bought the aforementioned pharmacies. Nikolay Marchenko is a journalist specializing in economic and international affairs. He has worked in the Sega newspaper, the LiveBiz.bg business portal, and is currently a correspondent in Sofia of the respected Russian newspaper Kommersant.